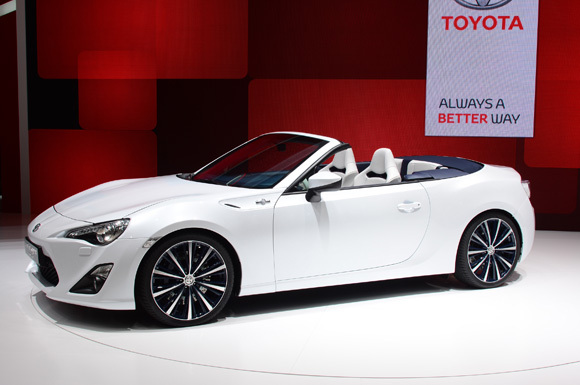 The wraps have finally been pulled from the new Toyota FT86-Open concept at the 2013 Geneva motor show. Revealing the car, Toyota Europe President Didier Leroy said: “GT86 has recaptured the spirit of driving, once thought lost. Perhaps that’s why it has won so many awards. We like to think that’s your way of encouraging us. The car was then driven onto the stage by chief engineer of the GT86, Tetsuya Tada. Mr Leroy concluded: “I know you are all wondering about facts and figures, and body rigidity. Well, we have has same worries and Tada and his team are deep into analysis. 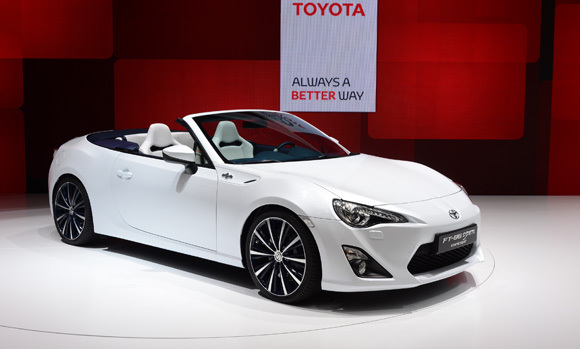 The cabriolet is the third member of the new GT86 family. Its debut follows the introduction of the standard coupe and new TRD tuned GT86 TRD, a limited edition model due on sale in the UK later this year. 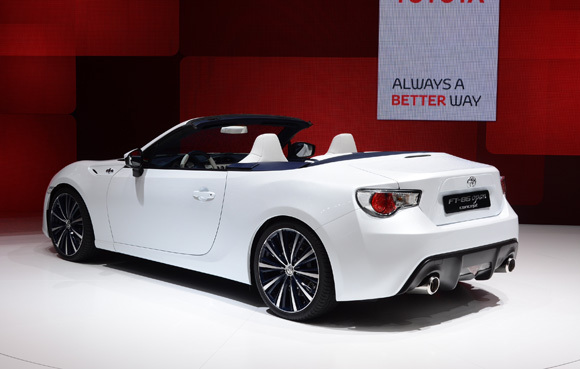 Although the stunning show machine has yet to be officially confirmed for production, the FT-86 Open concept helps pave the way for a convertible version of new GT86. Should there be a positive enough public reaction to the car, it could go on sale – but a potential date is yet to be announced. The concept has been designed under the watchful eye of Tetsuya Tada, the man behind the Award winning GT86. His brief was to deliver the lively, highly engaging and accessible performance and dynamic abilities of the GT86 with the added appeal of top-down motoring. External dimensions match those of the coupe, meaning that the car is 4,240mm long, 1,750mm wide and a maximum of 1,270mm tall. The FT-86 Open also uses the same engine and gearbox as the GT86. At its heart is the naturally aspirated, horizontally opposed 1,998cc four cylinder ‘boxer’ engine featuring Toyota’s D-4S direct injection technology. The engine is set low, lowering the car’s overall centre of gravity, and produces approximately 197bhp. It drives the rear wheels through a short-throw, six-speed manual gear shift or a six-speed automatic – the latter with the world’s fastest paddle shift speed, just two tenths of a second. The show car has a special pure bright white and navy blue colour scheme designed by Toyota Boshoku Milan Design (TBMD) to capture the spirit and atmosphere of Milan, one of the world’s leading centres for fashion and design. The bodywork is finished in white, contrasting with the blue of the roof. Inside, the perforated white leather upholstery is layered over a navy blue backing, with golden yellow accent stitching and carpets. As with the production GT86, it features MacPherson strut front and double wishbone rear suspension to give a direct handling feel, instant response and a high level of control. The electric power steering has a quick 13.1:1 ratio that’s on a par with racing models, while large ventilated front and rear disc brakes deliver excellent pedal feel for car control finesse. The extra bracing has added weight to the design, but despite this performance remains almost unchanged. That means the car offers a theoretical 0-62mph sprint of about 7.6 seconds, and a top speed of up to 149mph. Read all of our GT86 posts here. Stunning, How soon, how much and where do I put my money down? Unfortunately, we do not have any confirmation about the production of this concept just yet. We’ll be sure to keep you updated with any new model updates here on the Toyota Blog. please please take this into production -fantastic, just what the GT86 is about…. open top motoring.